I’m in the One Room Challenge homestretch, so I’m back this Saturday with another quick style spotlight — designer Meredith Ellis. Austin-based Meredith Ellis caught my eye more than any other designer in 2016. Her style resonates with me deeply. 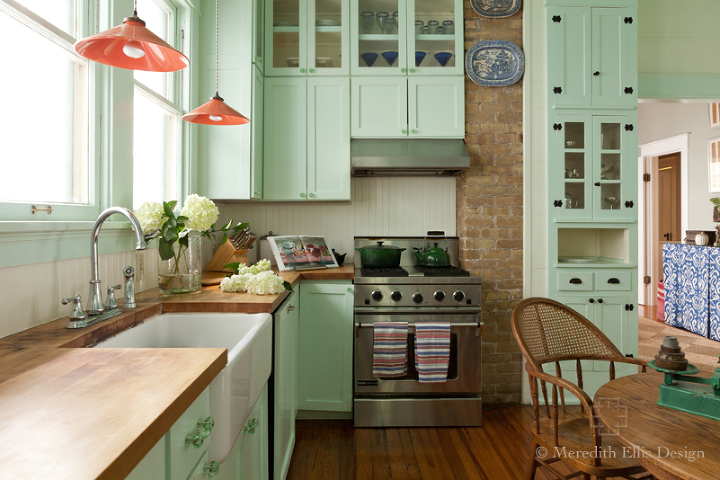 I first noticed her while thumbing through a copy of the March issue of Better Homes and Gardens, which featured her own adorable Austin bungalow. Then, I fell head-over-heels when she was named a 2016 New Trad by Traditional Home magazine, identifying her as one of the 10 most notable up-and-coming designers in the country. I had to look her up. The daughter of a designer, Meredith Ellis began her own career under the venerable Bunny Williams and further honed her craft under Thomas Beeton and Michael Smith. Enviable experience. In 2008 she hung out her own shingle in Austin. 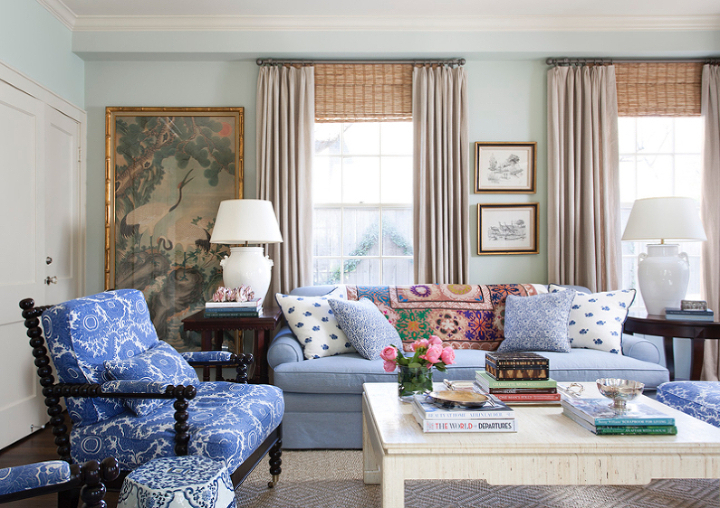 Her style is characterized by layers — materials, patterns, patina, textures, and colors — while always making sure a home never looks “decorated.” Her projects appear personal, collected, naturally extending from the personalities and lives of her individual clients. 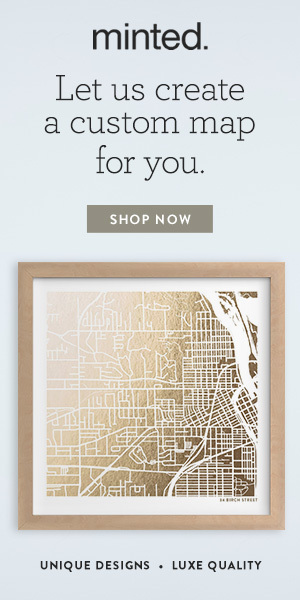 This is not “throw-away” decorating that will look dated in five years. See, you can make your grandmother’s brown dining table happy and fresh! And speaking of grandmas, how granny chic are the checks and kick pleats on the chair slip covers? 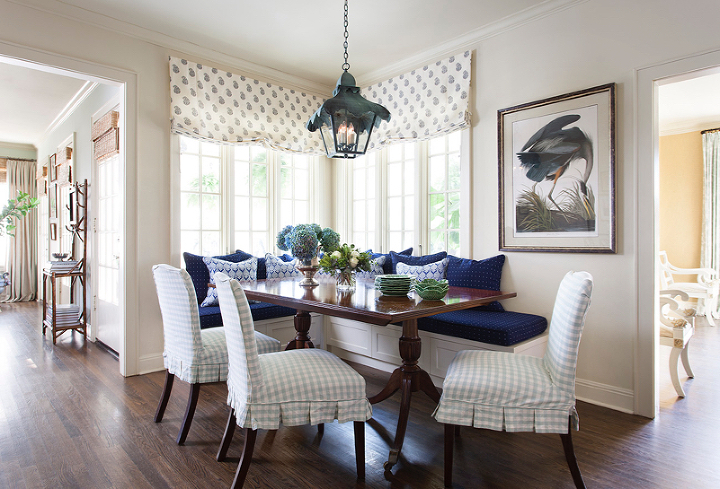 They look lovely with the block-print relaxed Roman shades. Traditional Persian rug, textured runner, happy global table skirt, luminous and light walls, gilt frames. Magic. Back again with checks, global prints, and textured shades. Canopy beds are always cozy, a room within a room, but this one doesn’t overdo the drapery, and I like that. Super cute bath. I love the blue, vintage-y wallpaper and the dark woodwork. A good look if you have stained wood, too. I ADORE this dining room. She does that “mix” so well (and believe me, the “mix” is not easy — that’s where so many people get into hodge-podge trouble!). Brown table, dark silk drapes, antique painting, and crystal chandelier give the room depth and the white Chippendale chairs, ikat seats and table skirt, and black chandelier shades give it vibrance and youth. The color palette holds it all together. Beautiful and restful. Hefty dose of vintage with brown furniture and art with a white bamboo tester bed. There are those global prints again, back in muted aquas, greens, and browns. I identify with so much of Meredith’s style — incorporating heirloom furniture, fresh colors, textures, great patterns, patina. What do you think of Meredith’s style? I’ll be back on Thursday with my second-to-last installation of my ORC with a great online carpet and stair-runner resource. Stay tuned!